do you think that the eurorack Wiard modules have more to offer than the 300 series? with more filter options, noisering, anti-oscillator, megawave, etc? does the Wiard euro line offer more interesting and sonic possibilities ultimately? If you consider the Malekko modules along with the other modules available in eurorack, then certainly you have a much wider sonic palette. One thing that became more clear to me the more I used a modular system was the way modules work synergistically. A complex oscillator through a cheesy 24dB low pass filter is no fun. The Anti-Oscillator being highlighted by Borg resonance is more of a good time. Control modules are the same, perhaps even more dependent on interlinked relationships to determine their function. I guess it comes down to your own habits and personality. I know some people who wouldn't dream to being tied down to a single format, and eurorack is their nirvana. 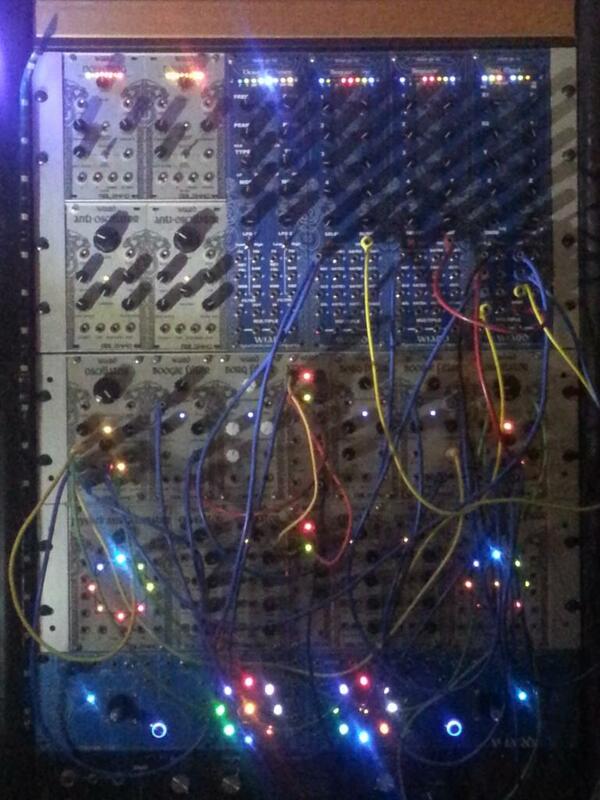 But for me, there is something extremely valid about a set of modules that provide harmonious functions. I find the limitation expansive and creatively conducive. The Wiard 300 Classic VCO has a noise (hidden, but it exists), can be used as a S/H,... an AR envelop (usable as envelop follower or LAG), a VCA with 2 inputs..., full control, multiple...,so so far a Wiard Classic VCO fils the bill of several Euro modules..so, well, quite a lot of sonic possiblities,..
@snow you answered your own question, plus you can add the MakeNoise Woggle Bug., @riot the Malekko lineup seems quite synergistic too, minus the Sequantizer. not malekkos. But I think the 300 series has the awesomeness. I supplment the wiard with one 126 hp rack of all Cwejman for the missing stuff, and additional stuff(adds ADSR, freq shifter, S+H, more filters, quad resonator(awesome with wiard stufF, and a multiphase output LFO, one of my favorite modules), and one 126hp with random euroness metropolis, etc etc. The great part about Wiard 300, it's compatible with euro! but honestly, the compact nature of all these modules is fantastic. and also all the attenuators you get...various inputs. Extra envelopes, VCAs... for the price you really can't beat it..
Actually, I was able to to produce a VERY believable noise! IIRC, using the ring modulated outputs of the woggle bug, both filters in series, borg 1 in low pass gate mode, borg 2 in low pass filter mode with resonance, and the borg lfo's in high mode into the disturb cv inputs of the woggle bug! A very sort of crunchy, dark, rumbling sort of noise but the color changes with adjusting the resonance and cutoff on borg 2. Legitimate wind and storm sounds. I didn't record it unfortunately, but I'm sure I could patch it up again. I really love these modules. I hope to get an envelator and sequantizer soon on the used market. or a waveform city again. A classic noise source was omitted as Grant did not want to make the same synthesizers that everyone else had made. Tips for using the noise source on the Classic VCO. Feed it back into FM input of the same oscillator that is outputting it, and mult the noise connection to your output. That should liven things up a bit and get you closer to a traditional noise. It works real nice as an "aux" output where you are using the non noise outputs of the VCO, and you fan off the noise to FM filter cutoff, just a touch doesn't get you classic white/pink noise but it does introduce subtle noise colouration. Replace the white noise in a NoiseRing with it. Now your NoiseRing is still a NoiseRing but now it's telepathically linked to your VCO. Please elaborate. Unmodded 1200 series NoiseRings don't even have a clock input, and - AFAIK - not to mention an external input to the shift register...? Very curious about discovering a new aspect of the NR now! Is the one you want to use. That's definitely on 1210a, not sure about 1210 but I think it is? The original white noise normalized to the shift register is -5/+5 so if you use the random you need to mix with an offset or alternatively leave the Chance knob low. It is there, my NRs are the 8 jack versions. So the internal noise signal is normalized into the Chance input? I.e. the Chance input *is* the shift register input? I thought Chance was a parameter that changed how the shift register works. If not, what does the Chance *pot* do *technically*? This is fun. The NoiseRing is the only Wiard module that I just know how to use, but don't really know how it works internally. Yep, Chance Input overrides the white noise that feeds the shift register. Change adjusts a comparator that determines the probability of a new bit entering the register instead of an old bit. Chance adjusts the reference of the comparator being fed by the white noise, and as such changes the probability of whether the new bit is a one or a zero. At centre you should have an even chance of 1 or 0. I found that the pot only had a small period of useful rotation to meaningfully adjust chance, like 42.5% to 57.5%. If CVed I think some Hinton brand attenuation & mixing may be in order! It's quite a simple module actually, but very effective! The linear/ exponential mod for the AR/ slew limiter is a fantastic enhancement. Cary built this into the last Waveform Cities she made and AFAIK Grant made some WFCs and Classic VCOs with it too. Linear integration is better for slewing pitch or other CVs where a slowly ending trail is just too much and you just want a slight rounding of the transitions. It was well worth the extra GBP 30 or so! AFAIK, in unmodified modules the response type can be set by a jumper on the PCB. The triangle output Grant probably switched to because it's quite useful for waveform scanning (basically it's twice the frequency as using the sawtooth while in ping-pong fashion, in other words a "DC compensated full wave rectification" of the digital transform function). The old "SQR" output has its own big advantage tho, which is that you can use it as a master to sync other VCOs. The Wiard's Sync input doesn't respond easily to softer inputs. Maybe if you have the 311C tho (can't wait to order mine!) you can use its digital gates to square up the triangle - depends on how fast the gate reacts/ up to which frequency it will follow. Enough for now - just wanted to contribute some thoughts on a few of the various mods and changes in the 300 series. The triangle output Grant probably switched to because it's quite useful for waveform scanning (basically it's twice the frequency as using the sawtooth while in ping-pong fashion, in other words a "DC compensated full wave rectification" of the digital transform function). Can you say a bit more about how that can be used musically? Not really, sorry. If I got you right that's like asking how e.g. a sub-oscillator, hard sync or any given waveform can be useful musically. If you mean in the classical sense of "triangle is good for flute patches, saw is good for strings" etc then I have to pass even just because of the sheer number of the waveforms in an EPROM.